KoolApp™, the essential tool for all HVAC-R professionals. 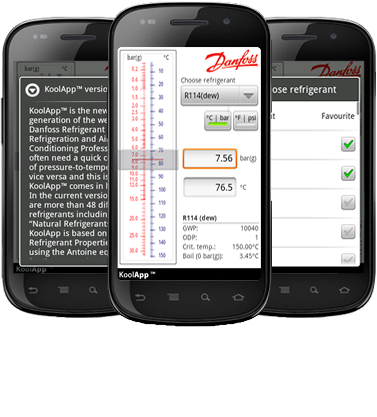 Based on the well-known Danfoss Refrigerant Slider, KoolApp™ turns your Android smartphone into a user-friendly, quick pressure-to-temperature refrigerant converter. It is designed for installers, distributors and producers of air conditioning and refrigeration equipment, and will also be useful for other industry professionals and students.